DESCRIPTION -- From the French Line several paperwork items connected with the vessel The Antilles and all items are in a good condition. 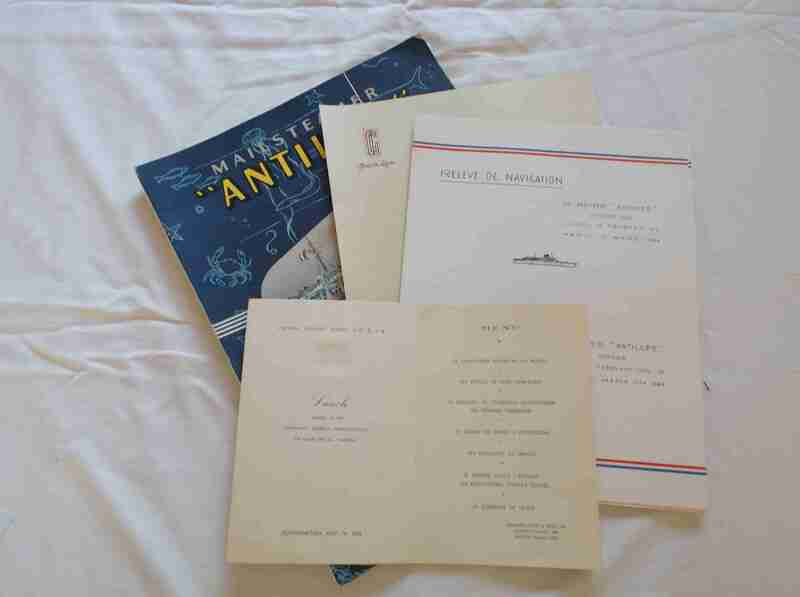 The items are contained in a cardboard folder and are a log book for the 10th February 1964, a dining menu for the 7th May 1954 and an unused piece of letter headed paper. DESCRIPTION -- An early item from January 1953 which is a 'Bill of Lading' for the French Line vessel the SS Ile De France. It is in an excellent condition and covers dates and ports of call. HISTORY -- The SS Ile de France was a French ocean liner built in Saint-Nazaire, France for Compagnie Générale Transatlantique. The ship was the first major ocean liner built after the conclusion of World War I, and was the first liner ever to be decorated entirely with designs associated with the Art Deco style. It was neither the largest ship nor the fastest ship, but was considered the most beautifully decorated ship built by CGT (also known as the "French Line") until the Normandie. 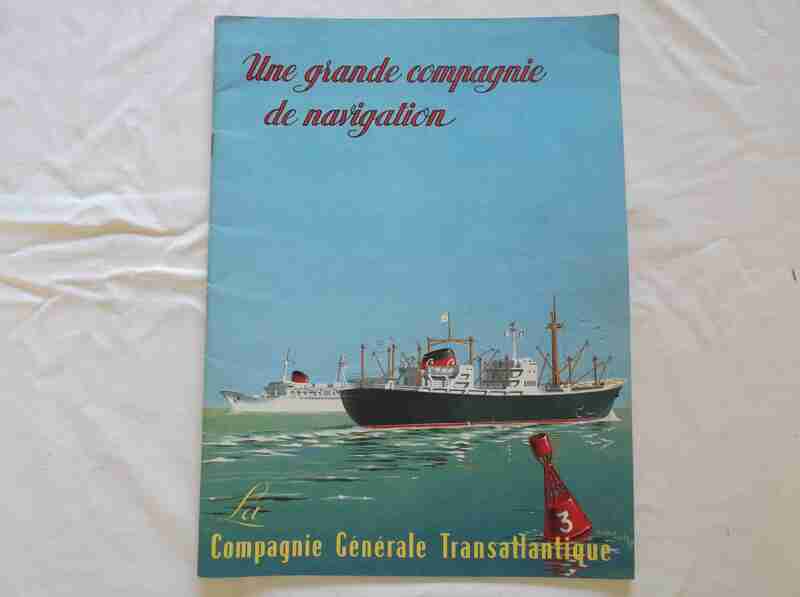 DESCRIPTION -- From the early 1960's this is a great find and is a French Line shipping company magazine entitled 'La Compagnie Generale Transatlantique', covering the vessels of those days and various shipping information. There are some great full colour pictures in this large magazine edition which contains nearly 30 pages and is in a great condition. HISTORY -- The French Line, was a shipping company established in 1861 as an attempt to revive the French merchant marine, the poor state of which was self-evident during the Crimean War of 1856. The company's first vessel, the SS Washington, had its maiden voyage on 15 June 1864. Other than operating ocean liners, the company also had a significant fleet of freighters. The company survived both World Wars, but the development of jet travel doomed its mainstay passenger liner business. 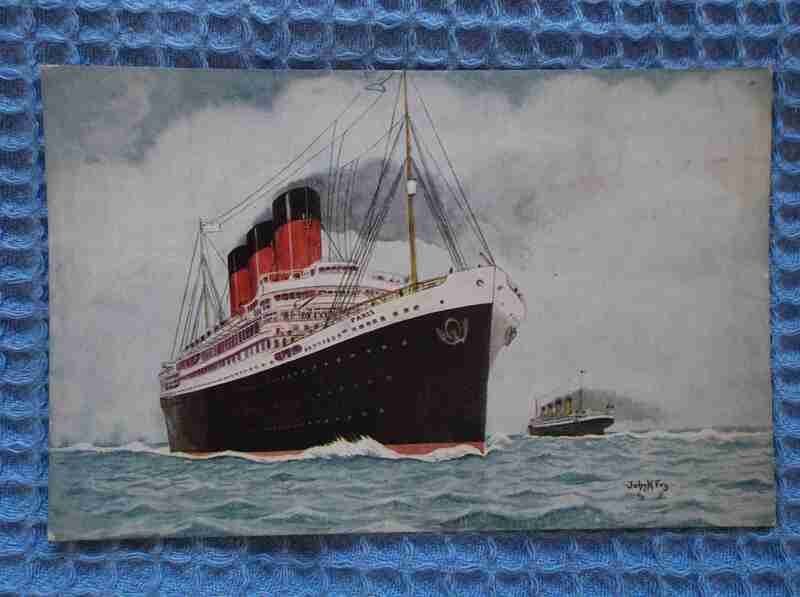 DESCRIPTION -- Built in the early 1900's the SS Paris is a famous ship from the French Line shipping company and this full colour postcard is a great find and is in a great unused condition. HISTORY -- The Paris was a French ocean liner built in Saint-Nazaire, France for the Compagnie Générale Transatlantique. The French Line's Paris was built by Chantiers de l'Atlantique of St. Nazaire. Although the Paris was laid down in 1913, her launching was delayed until 1916, and she was not completed until 1921, due to World War I. When the Paris finally completed, she was the largest liner under the French flag, at 34,569 tons. DESCRIPTION -- Passenger List from the French Line vessel The Liberte and is dated 17th December 1958 and is in a very good condition. The vessel was scrapped in 1962. HISTORY -- The SS Liberté, formally the SS Europa, was a German ocean liner built for the Norddeutsche Lloyd line (NDL) to work the transatlantic sea route. She and her sister ship, Bremen, were the two most advanced, high-speed steam turbine ocean vessels in their day, and were a part of the international competition for the Blue Riband. The Compagnie Générale Transatlantique (shortened to "CIE. GLE. TRANSATLANTIQUE", or CGT, and commonly named "Transat"), known overseas as the French Line, was a shipping company established in 1861. DESCRIPTION -- A superb large sized magazine celebrating the centenary of the French Line shipping company which contains almost 30 pages and is in a great condition (click on the picture for a view of the inside on the item). HISTORY -- The Compagnie Générale Transatlantique (shortened to "CIE. GLE. TRANSATLANTIQUE", or CGT, and commonly named "Transat"), known overseas as the French Line, was a shipping company established in 1861 as an attempt to revive the French merchant marine, the poor state of which was painfully highlighted during the Crimean War of 1856. The company's first vessel, the SS Washington, undertook her maiden voyage on 15 June 1864. 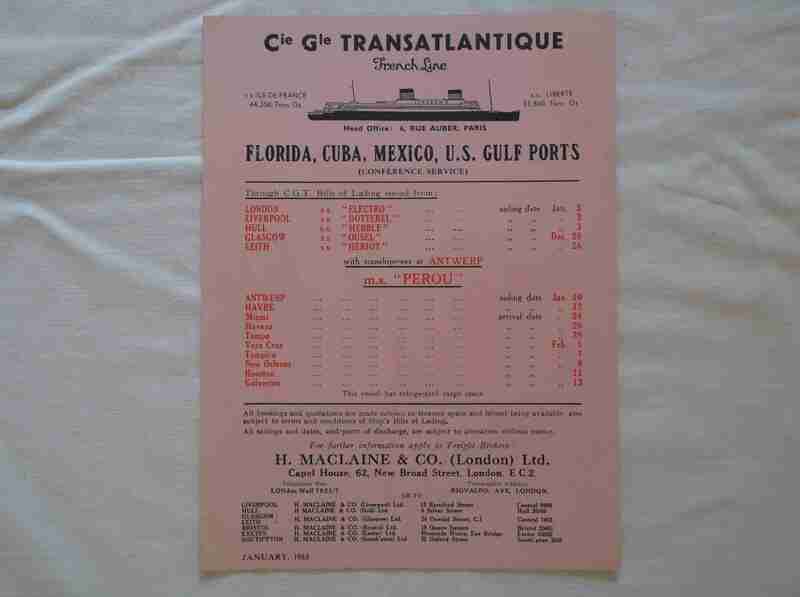 DESCRIPTION -- Ships cruise Times & Fares guide and a routes of passage and excursion guide from the French Line shipping company. The two items are dated from 1964 and are in a very good condition. They cover information for the vessels the SS Antilles, the SS Flandre and the SS Colombie (click on the picture for a close up view). DESCRIPTION -- Set of documents showing ships cruise Times, Fares and Routes of Passage and Excursion details for the French Line shipping company. The items are dated from 1964 and are in a good/reasonable condition. They cover information for the vessel the SS Antilles and the shipping company. DESCRIPTION -- Ships cruise Passenger List from the French Line vessel The SS Antilles and is dated February 1964 with the Passenger List being in a very good condition. HISTORY -- The SS Antilles was launched on April 26th 1951, 6 months before sistership Flandre. The SS Antilles construction was beset with delays, and she was handed over for service on her designed Caribbean route in December 1952. She ran a number of Mediterranean cruises before her maiden Caribbean voyage from le Havre in May 1953, running opposite the Colombie. In July 1971 she hit a rock off Mustique and caught fire and was lost. 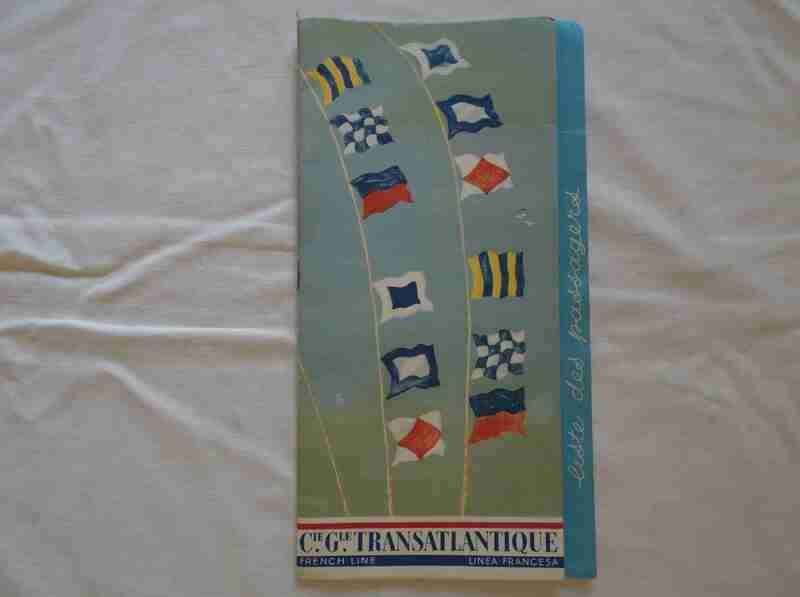 DESCRIPTION -- From the French Line Shipping Company and dating 1963 this is a ships cruise sailings and fares guide covering several vessels from the French Line fleet of ships. The ships mentioned are the SS Antilles, the SS Flandre and the SS Colombie. The item is in a good condition and highly collectable. HISTORY -- Aside from operating ocean liners, the French Line company also had a significant fleet of freighters. The company survived both World Wars, but the arrival of jet travel doomed its mainstay passenger liner business. In 1977 the company merged with the Compagnie des Messageries Maritimes to form the Compagnie Générale Maritime. In 1996 the company Compagnie Générale Maritime merge to form the CMA CGM.